Goodfellas is a violent and exhilarating film starring Ray Liotta, Lorraine Bracco, Robert De Niro and Joe Pesci, based on the true story of Henry Hill (Liotta), an aspiring criminal who ends up in the FBI's witness protection program after testifying against his former partners. 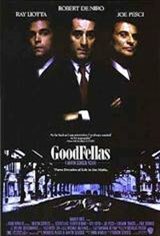 As a poor Irish-Italian growing up in 1950's New York City, Hill rises through the ranks of his Brooklyn neighborhood's organized crime branch, and with money from the mob he begins living the good life, along with a beautiful wife, Karen (Bracco), a fancy house, and the best seats at the most exclusive restaurants. But when a botched robbery lands Henry in prison for a brief period of time, his reckless infidelities and drug abuse damage his association with his adopted mob family. Based on Nicholas Pileggi's book Wiseguy.